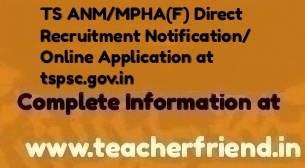 TS Medical Posts ANM/MPHA(F) 152 Vacancies Direct Recruitment Job Notification/Online Application/Vacancy Position/Age limit/ How to Applying online application Step by step Process and Important Scheduled Dates Instructions at tspsc.gov.in/TSPSC Announced ANM/MPHA(F) 152 Vacancy Jobs Recruitment Notification Online Application at tspsc.gov.in. Application to be made available on Commission’s WEBSITE (www.tspsc.gov.in) to the post ANM/MPHA(F) in Telangana Vaidya Vidhana Parishad. The Examination (Objective Type) dates will be announced later. The Commission reserves the right to conduct the Examination either COMPUTER BASED RECRUITMENT TEST(CBRT) or OFFLINE OMR based Examination of objective type. Before applying for the posts, candidates shall register themselves as per the One Time Registration (OTR) through the Official Website of TSPSC. Those who have registered in OTR already, shall apply by login to their profile using their TSPSC ID and Date of Birth as provided in OTR. Hall Tickets can be downloaded 07 days before commencement of Examination. Candidates are requested to keep the details of the following documents ready while uploading their Applications and updating OTRs if necessary. Educational Qualification details i.e., SSC, INTERMEDIATE, DEGREE, POST GRADUATION etc. and their Roll numbers, Year of passing etc. BC’s obtained from Mee Seva/ E Seva i.e., Enrollment number and date of issue for uploading in OTR. The Details of Vacancies i.e., Community, District Wise and Gender wise General /Women may be seen at Annexure-I. The number of vacancies and Departments are subject to variation on intimation being received from the appointing authority, before the last date for submission of Online applications. TSPSC vide G.O.Ms.No.181 Finance (HRM-II) Dept., dt.11-12-2017 (TVVP) for 86 vacancies, therefore, subject to receipt of detailed indent from the departments concerned there is a likelihood of change in the posts notified. The candidate should note and visit TSPSC website for revised break-up if any. Family Welfare (B1) Dept, Dated 09-09-2017. AGE: Minimum 18 years & Maximum 44* years. The age is reckoned as on 01/07/2018 (Rule- 12(1)(a)(v) of State and Subordinate Service Rules). MinimumAge (18 years): A Candidate should not be born after 01/07/2000. Maximum Age (44 years): A candidate should not be born before 02/07/1974. The Upper Age limit will be relaxed as per Rules and will be calculated on the above lines. The Applicants have to read the User Guide for Online Submission of Applications and then proceed further. The Candidate has to visit the WEBSITE http://www.tspsc.gov.in and fill the OTR application if not registered earlier to obtain TSPSC ID. While filling the same, the candidates have to ensure that there are no mistakes in it. The Commission bears no responsibility for the mistakes, if any, made by the candidates. The candidates have to visit the website http://www.tspsc.gov.in to submit Application and Click on the Link with Notification Number and Name, provide TSPSC ID and Date of Birth to proceed further. Candidate has to verify the details fetched from various databases pertaining to qualification, caste, Aadhar etc, and displayed on the screen. If the displayed details are correct he/she has to click Yes on confirm button. If any details are not displayed or need to be changed, he/she should click No on confirm button. If details are not displayed a text box will open and candidate has to feed the details manually. Required documents have to be uploaded by clicking the upload button. In addition to the details obtained from OTR database, Notification specific details such as Examination Centre opted, required qualification, university details, eligibility and accepting declarations etc. are to be filled by the candidate. Preview and Edit facility is available to make changes and submit for proceeding to Next step of making online payment of fee. Immediately on entering the above details, the applicant will get payment gateway of SBI ePay. The applicant should pay the prescribed fee as specified through any of the four modes of payment online. Separate instructions have to be followed for each mode of payment. After payment of fee, the PDF Application will be generated which contains the particulars furnished by the candidates. The ID No in the PDF Application form has to be quoted for future reference / correspondence. Candidateshall note that, the details available with OTR database at the time of submitting the application will be considered for the purpose of this notification. If, any changes are made by the candidate to OTR database at a later date will not be considered for the purpose of this Notification. Hand written/ Typed/ Photostat copies/ outside printed Application Form will not be accepted and liable for rejection. The applicants should be willing to serve anywhere in Telangana State. The Commission is not responsible, for any discrepancy in Bio-data particulars while submitting the application form through Online. The applicants are therefore, advised to strictly follow the instructions and User guide in their own interest before submitting the application. The particulars furnished by the applicant in the Application Form will be taken as final, and data entry is processed, based on these particulars only by Computer. Candidates should, therefore be very careful in Uploading / Submitting the Application Form Online. Incomplete/incorrect application form will be summarily rejected. The information if any furnished by the candidate subsequently in any form will not be entertained by the Commissionunder any circumstances. Applicants should be careful in filling-up the application form and submission. If any lapse is detected during the scrutiny, the candidaturewill be rejected even though he/she comes through the final stage of recruitment process or even at a later stage. Before Uploading/Submission of Application Form, the Candidates should carefully ensure his/her eligibility for this examination. No relevant column of the application form should be left blank, otherwise application form will not be accepted. Get Download Complete Notification Information Click Here. Get Applying online application Click Here. Get Download TS Agriculture Officers Job Notification Click Here.